I have been wearing Oakley sunglasses since 1987: Factory Pilots, Blades, Razor Blades, Frogskins, M Frame, O Frame, Flak Jacket, prescriptions sunglasses and daily prescription eyeglasses, you name it. When presented with the opportunity to review the ultra light, frameless EVZero Path while attending Winter Outdoor Retailer, I jumped at the chance. The Oakley EVZero Path feels like nothing in your hand and is even lighter on your face with a frame-less, completely unobstructed panoramic view of the trail and your surroundings. Though minimal, these glasses are durable, with a good bit of flex (to avoid snapping) and easily spring back to their original position. I never flexed them too far, but under normal use it seems as they would hold up well over time and the only chance of true damage would be in situations that would break any pair of sunglasses (ie stepping on them, running them over or a catastrophic face plant). Because they are so light and aided by the grippy nose piece and ear temples, I get absolutely zero bounce on my face and they fit me perfect straight out of the box. I have a small face and the EVZero Path fits me well, a bit large for daily use, but great for running and cycling, where full coverage is paramount. Sam: I do strange things with sunglasses... I wear them over my prescription specs...The EVZero fits perfectly. All I have to remember is to have the hinge bump out sit on top the corresponding hinge on my other glasses. I also use a Croakies ARC System retainer with all my glasses. 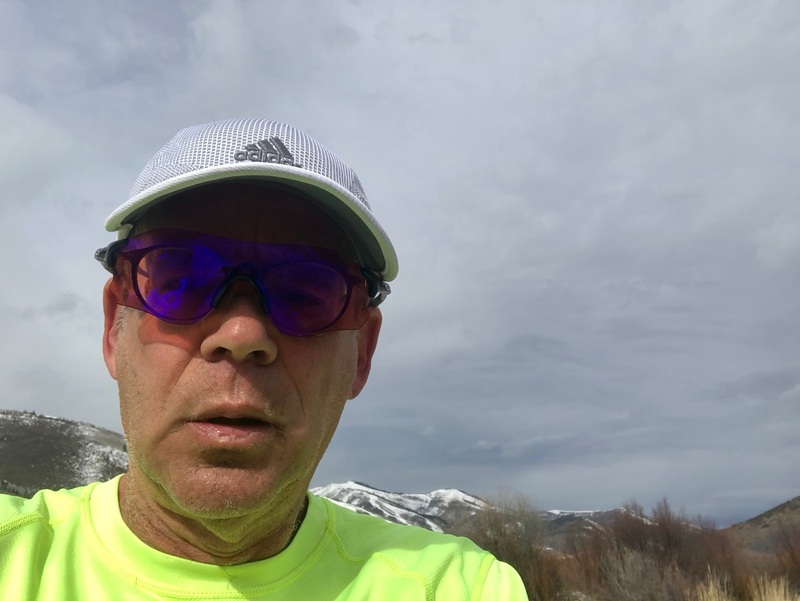 What I immediately noticed was how light they were compared to my Julbo Aero Lite and the very wide crystal clear field of vision and sharp contrast. Jeff: Though the earstems are NOT interchangeable, the nose piece is removable, which is very handy when cleaning the lens. An extra is even included with this model. Oakley offers a variety of Prizm lenses, each tailored to increase contrast for a specific sport or environment, such as Trail for the purposes of this review, as well as Road, Golf, Snow, Field, Cricket, Deep Water, Shallow Water, MX, Everyday, some of which are polarized, some are not. 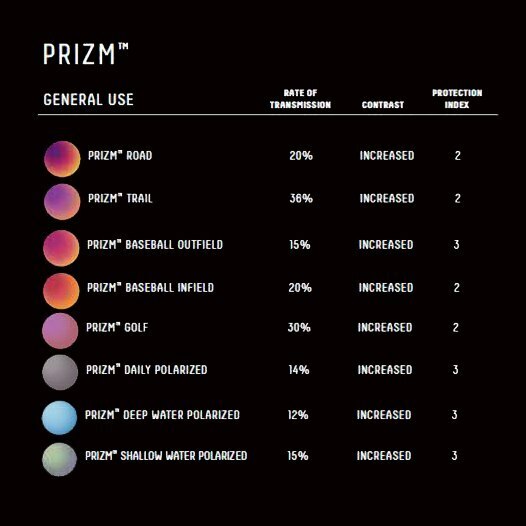 The chart below gives information on some of the Prizm lenses offered. You can see that the Prizm Trail allows for 36% Visible Light Transmission, the lightest of this bunch and the lightest non photochromic (transition) sunglasses lens I have used to date. Below is a screen shot from the Oakley website of the interactive slide bar photo, which does its best to represent the difference between wearing Prizm Trail and not. I think it is a bit exaggerated to sell their product, but realistically concede that it is difficult to accurately convey without actually using the glasses in real life. Either way, it does a reasonable job to get the point across. So, how do they perform in real life? I am truly impressed with the clarity and lens quality. Contrast is excellent on the trails and really enhances the definition of every little rock, stone, root and undulation in the trail. With 36% light transmission (VLT), the Prizm Trail is best suited for running in shady areas with lots of tree cover, overcast days or just after dawn or just before dusk. When the sun is shining bright, even in winter here in Colorado, and especially when there is fresh snow and brilliant sunshine, I tend to lean toward a lens that is more in the 10-15% VLT range. With the 36% VLT of the Prizm Trail, I find that I can get by better than I imagined (I have sensitive eyes), but when compared side by side with my Oakley Black Iridium sunglasses, my eyes are much more at ease with the darker lens. I was well aware of this ahead of time, so not a knock at all on the Prizm Trail at all, simply a realistic suggestion as to their ideal use. Sam: Unless I am on snow or the sun is very bright I prefer a lower light transmission lens. I often run at dusk or in overcast conditions and when trail use in and out of the trees is in the mix as well I value the contrast and light over yet darker protection. So, the Trail lens is just about ideal for me and even when raining or snowing I have not felt the need to remove them. Jeff: The Prizm Road however has a 20% light transmission rate and though titled a "Road" lens, is also ideally suited to the trail, just in slightly brighter conditions. Though I am more accustomed to 10-15% for most bright sunny days (especially with fresh snow, high altitude, summer sun), I found that the Prizm Road lens is appropriate dark for all but the most extreme sunny conditions, yet are appropriately not too dark in shady woods and fading light. For my use here in Colorado, the Prizm Road lens is more versatile. The below 3 photos are of the Prizm Trail with a "grapefruit" tint, enhancing contrast, reminiscent of a low light ski goggle. Though not a lens labeled for "snow", I found the Prizm Trail to be great on overcast, snowy days, as they brighten the surrounding and provide a warm, high contrast hue. The setting in the photo below is perfect for the Prizm Trail lens, a sunny day with a low angle sun late in the afternoon causing a lot of long shadows and fading light. The Prizm Trail does a great job easing the transition between light and dark. An out in the wild comparison between the lenses, Road left, Trail right. The Prizm Trail has high contrast, perfect for cloudy days, in the woods and lower light conditions, however on this bright sunny day, are a touch on the light side. The Prizm Road however tones down the bright light, while still retaining a high level of contrast, easily picking out shadows and any obstacle or undulation in the trail. Sam: In addition to the VLT being in my sweet spot, I have been struck by the sharp contrast provided by the Trail lens. The tint is not overdone or artificial but effective. I am also amazed by the wide peripheral field of vision of the lenses, unobstructed by any frame elements, the widest and most open sight lines of any glasses I have ever used. All that lens and the relatively high light transmission also provides excellent bad weather coverage and contrast on snow. The Trail lens is a great option for those activities which start in decent even sunny weather and end in a dark storm as I experienced during one of my test runs. 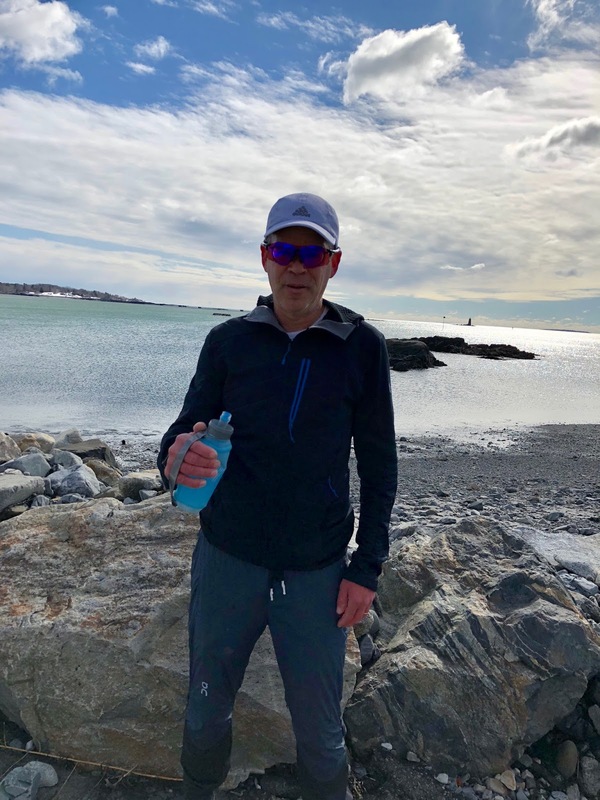 Jeff: I also find the EVZero Path to ventilate quite well under most conditions, but on days where it was rainy, snowy or quite humid right after a snow storm I did get some fogging while running/hiking slowly uphill (high output but slow speeds). That said, I have honestly never had a pair of glasses that have not fogged in the conditions described above. With a little better airflow from running faster on flats or downhills and certainly while cycling, fogging has not been an issue under the same weather conditions. Other than those damp days, I have never had them fog in the least. The EVZero Path is also very close fitting, good for keeping out the wind while riding or on a breezy day, but I do notice my eyebrows touch the top of the lens and leaves a sweat mark. I can adjust slightly to minimize contact, but may need to trim the brows a bit (though my eyebrows are pretty slim and trim as it is). If you have really bushy brows, this could be an issue. I would highly recommend the EVZero Path for running, hiking and cycling (or a wide variety of other outdoor applications), as they are crazy light with excellent unobstructed visibility and great wind protection. The Prizm Trail lens is sharp and clear, enhancing ground contours and obstacles in impressive fashion. 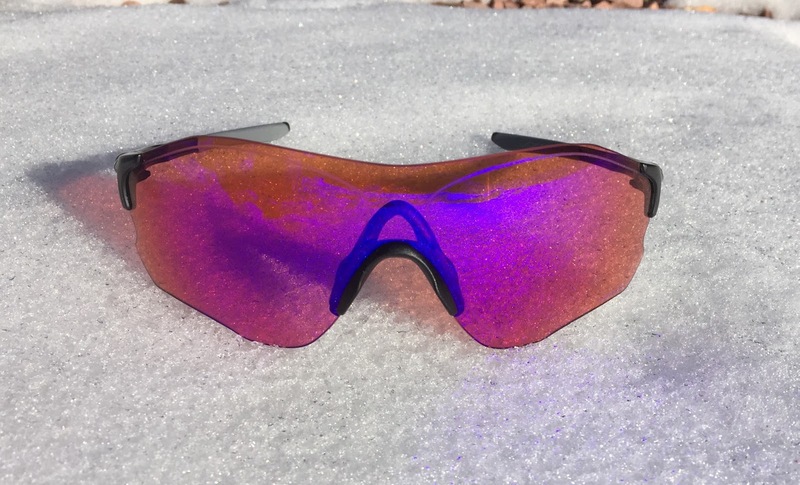 If you run in the woods mostly, live in a less sunny environment or run early or later in the day, I would highly recommend the Prizm Trail lens. If you live in a predominantly sunny location, high altitude, visit the beach, run mid day or have sensitive eyes, I would strongly consider no less than a Prizm Road lens with 20% VLT or even one of the darker Prizm lenses. All in all a hit from Oakley and one of my favorite pair of sunglasses to date. If I could come up with one area of improvement, it would be to allow for interchangeability of the lenses as some other models of Oakley allow and as far as I can discern, that is not an option with the EVZero. Sam: I run, nordic ski and hike in both New Hampshire and Utah, often at dusk. The Trail lens, while not what I would use for a sunny, summer mid day run on snow or open terrain, covers all the other bases for me. Unlike photochromic lenses which tend to darken in cold and stay dark even as light fades, the Trail has consistent relatively high light transmission regardless of temperature, is great for runs in and out of trees and shadows, for overcast flat light conditions, and at dusk making it broadly versatile for me. Light with truly outstanding lens clarity, contrast, and a broad field of vision EVZero Path Prizm are a great choice for endurance sports of all kinds. Bolle 6th Sense with Modulator Brown Emerald Oleo AF lens - Best for changing light conditions, from moderately shaded trails, cloudy days, early morning, late evenings all the way up to the brightest sunny conditions. Great definition, optical clarity, very light and unobstructed field of vision and very custom fit with malleable ear stems and nose bridge. The Oakley was provided at no cost. The opinions herein are entirely the author's. Nice article. I am a big fan of the Prizm Trail lenses in my Flak Jackets. The subtle rose hue in my Flak Jacket Trail lenses makes colors and contrasts pop, and they work well in both sun and shade. BUT be advised that the EVZERO Trail lenses do NOT have this rose tint. Instead they have an orange tint (you can see it the photos in this article) that I find intolerable. Too bad--I hope they can correct this in the future. If they do, I will be first to buy a pair.